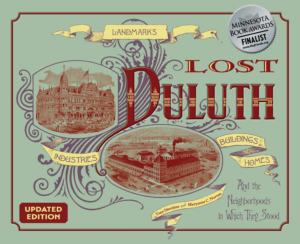 As the automobile became more popular, the Interstate Bridge became more congested—and its location was hardly convenient for those in Duluth’s and Superior’s western environs. 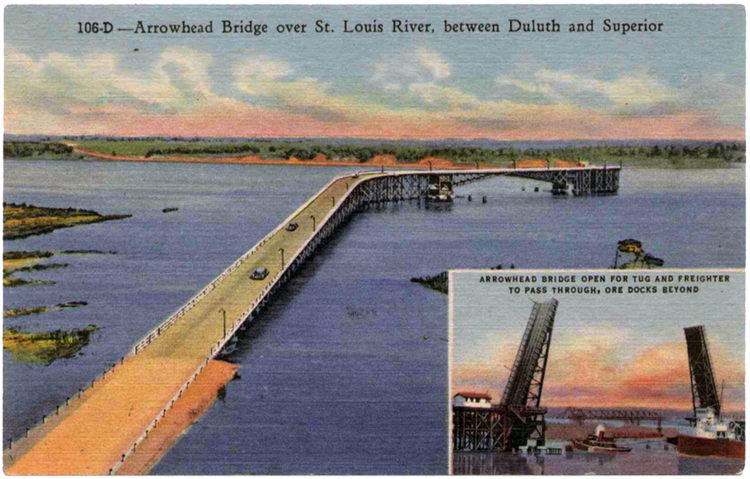 Plans for the Arrowhead Bridge took shape in 1925 when the War Department issued a permit for a bridge over a narrow stretch of the St Louis River. Superior’s Arrowhead Bridge Company began construction in 1926 and finished a year later. The Arrowhead, technically a rolling lift bridge, was built entirely of wood except for its steel 300-foot center lift span. It stretched eight hundred feet from Lesure Street on Grassy Point in West Duluth to Superior’s Belknap Street, extending U.S. Highway 2 across the state line. The center span was actually two spans that met in the middle; each lifted on a pivot to allow marine traffic to pass; it took ninety seconds for the spans to open or close. The Arrowhead Bridge’s opening on July 16, 1927, was a gala event. Celebrations took place on both sides of the St. Louis River, in West Duluth at Memorial Park and along Superior’s Tower Avenue. Each celebration led a parade onto the bridge, stopping at either side of the new bridge’s lift span. While the crowd waited, the spans lifted and the replica Viking ship Leif Erikson, which had just arrived in Duluth, was escorted between the spans by the fire tug McGonagle, which sprayed huge spouts of water along the way. After the watercraft cleared and as the spans lowered, Duluth mayor Sam Snively and his Superior counterpart, Fred Baxter, met in the middle and clasped hands just as the spans closed. Fireworks were launched, the United States Naval Reserve Band and the Superior American Legion’s drum-and-bugle corps played, and ships and boats and industrial plants all sounded their whistles. The Duluth marchers then paraded in Superior as the Superior paraders passed through West Duluth. A time capsule containing souvenirs of the event was encased in one of the bridge’s piers. Superior’s Walter Buch claimed to be the first person to cross the bridge in a car—and thereby first to pay its toll. In 1963 the bridge became jointly owned by Minnesota and Wisconsin and the toll was dropped. The bridge itself came to an end in 1985 after being rendered obsolete with the construction of the Richard I. Bong Memorial Bridge. It cost $700,000 to demolish the bridge, $200,000 more than the original construction cost.